Two fighter jets dropped GBU-49 laser-and-GPS guided bombs on a forest to contain a large fire. Swedish Gripen fighter jets bomb forest to fight fire. The Swedish Air Force has deployed two JAS-39 Gripen fighter jets to attack the front lines of forest fires raging through the country. Wildfires have been burning through the forest in Älvdalen, central Sweden, for 13 days. The blaze is in a target-practice area which contains undetonated shells and does not allow safe access to firefighters from the ground. Other conventional methods have been used without good results before moving to an extreme measure. "The oxygen from the fire can be removed with the help of a bomb and in this case it was possible to try it, because the fire is at a firing range," said fire and rescue team leader Johan Szymanski in a statement. 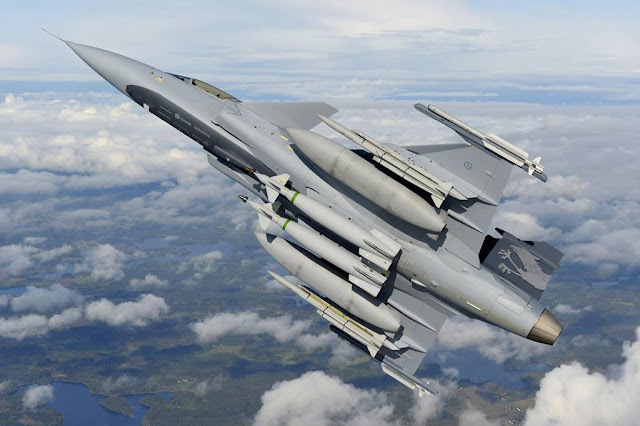 The Gripen fighters were loaded up with large GBU-49 laser-and-GPS guided bombs. They hefted them to a height of 3000m. When over the target, precisely determined areas of the fire-front were designated. The bombs were then dropped — homing in on the signals to guarantee their accuracy at speeds of up to 550km/h. “Our preliminary assessment right now is that this had a good effect, ” the fire team leader said. When they exploded, each 220kg bomb quashed the flames for a radius of up to 100m. The shockwaves simply blew out the flames in the same way our breath does to candles. And such an explosive technique is already in use to douse fires in oil wells. Some 25,000 hectares of forest are alight in Sweden. This is dramatically higher than its previous record of 14,000ha, set in 2014.